Lawrence Orchards is a family-run orchard and farm market located less than 2 miles south of Marion, Ohio. We specialize in apples, growing 26 different varieties in season. We also grow an assortment of summer vegetables, other tree fruits, pumpkins, squash, Indian corn, gourds, horseradish, and Christmas trees. The Orchard is closed for the season. We will reopen in Mid-June. Follow us on Facebook to keep up with the latest news! Our apple cider is fresh-pressed each week from our own wonderful apples. There are no preservatives, water, or sugar added; only fresh apples! Our cider is not pasteurized but it does go through a simple ultraviolet light treatment in order to make it perfectly safe from any possible pathogens. Our blend of 6-8 varieties is award-winning. And it's available in both gallon and half gallon jugs. Was a huge success! Thank you. Saturday, September 29 from 10am - 5pm we celebrated Applefest at the Orchard! Our farm market is open from June until Christmas. Customers can sample our products as well as pick their own apples in season. We also offer lots of farm-made products such as jams and jellies, syrups, candies, and other goodies. We produce unpasteurized fresh apple cider in our cider mill which is available from September through Christmas. Fruit baskets are another specialty of our farm market. 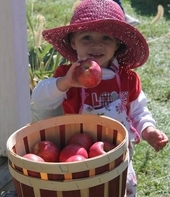 We host several special events highlighted by Applefest in late September.